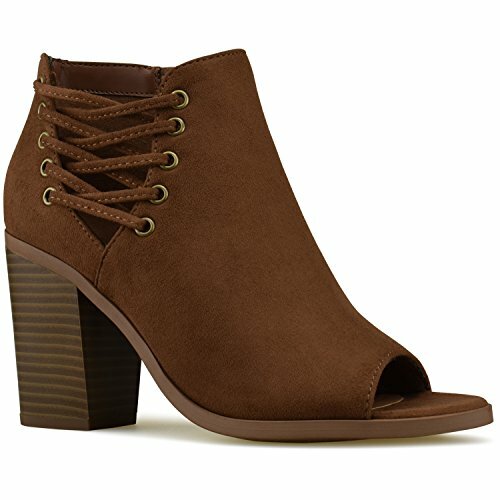 Looking for a pair of vegan dress boots to buy? You're in luck. Here are 10 cruelty-free pairs for when you need to look your best. Glamorous women's red ankle bootie dripping with red crystal embellishments of various shapes and sizes. Has a sleek pointed toe and wrapped stiletto heel 4" in height. Inner side zipper makes getting in and out of the boot super simple. Footbed is lightly padded to support your step. Advertised as vegan: No, but the materials listed are man-made. Pros: Eye-catching fashionista boots made for a girl's night out. Pair with a bodycon dress and a beaded bag and you're ready to hit the dance floor. Cons: These boots aren't inexpensive, and they're reported to be on the narrow side. Very dapper men's dark brown ankle-height dress boot with an inner side zipper and stylish outer side buckle. The material looks quite like real leather, though it's synthetic. Has a rubber sole for good grip. Tapered foot is elegant and contemporary with a slightly rounded toe. Made in the Chelsea style, but without the elastic paneling. Pros: Fantastic formal wear for business meetings, weddings and fancy occasions of all kinds. But just because these boots go well with a suit doesn't mean you can't wear them with jeans and a nice cardigan. They'll add sophistication to any outfit. Cons: Reviewers find that these boots are not very breathable. Women's cognac brown peep toe bootie with corset-style lacing and brassy eyelets on the outer side and a zippered inner side. Thick stacked heel is approximately 3" with an attractive wooden appearance. Insole is cushioned and supportive. Advertised as vegan: Yes — vegan and eco-friendly. Pros: You can't beat the price of these cute dress-up boots. The open toe is great for summer nights you want to look sharp for, but the faux suede makes them cozy enough to wear on sunny fall days. Try these with large knits or floral wrap dresses. Cons: Though they're wearable in cool and warm weather, they may not be great for particularly hot or cold temperatures — milder weather only. 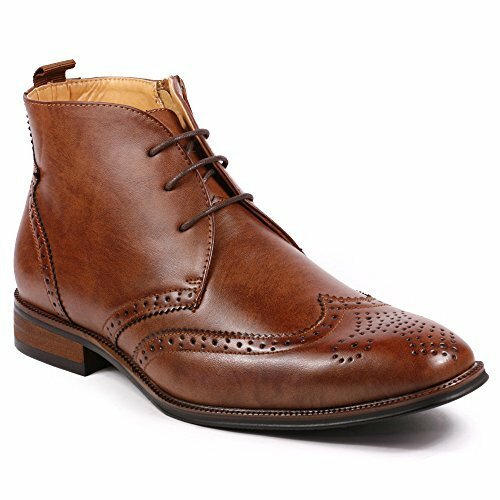 Luxuriously brogued men's ankle boot in chestnut brown faux leather. Toe features a tasteful wingtip design. Block heel has subtle black and dark brown layers for fetching detail. Has an inner side zipper and front lacing with a dark brown bootlace so you can tighten as much as you need. Padded insole lends comfort for long-lasting wearability. Pros: Another perfect pair of boots for dinner parties and traditionally formal settings. These are definitely on the fancy side, and surprisingly for quite a steal. If you're looking to dress to impress without emptying your wallet, these might be for you. Cons: They'll probably need to air out after you purchase them as there's a strong smell (according to reviewers). Striking ladies' black slouch boot covered with shimmering, diamond-like rhinestones. Pointed toe and 4" rhinestone-wrapped cone heel are very chic. Sole is black and grooved for slip-resistance. Shaft is 17" in height and pull-on style. Pros: These boots will bring out your inner diva. They're incredibly posh and stylish with the slouchy leg and all that glitz and glamour. You'll feel like a million bucks wearing these, a mini dress and chandelier earrings. Cons: Very expensive and may require a little added cushioning inside if you want to wear them for more than a couple of hours. 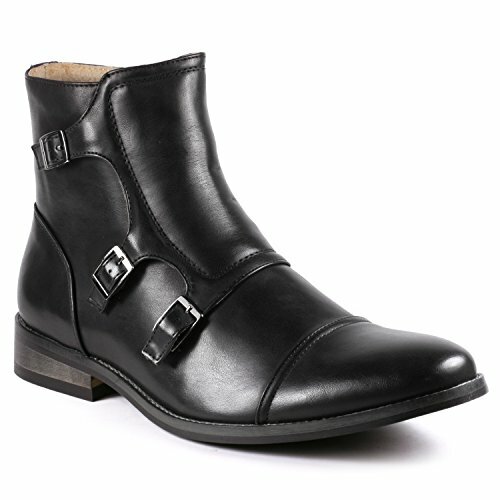 Men's black faux leather dress boot with three monk straps and silver buckles for a polished, minimalist look. A little taller than a mid-ankle boot with slender contouring. Foot is gracefully tapered with a rounded cap toe. Sole and fashionable block heel are accented with various shades of dark gray layering. Zips up on the inner side to help you in and out of the boot. Advertised as vegan: No. The product description lists faux leather uppers and synthetic soles. 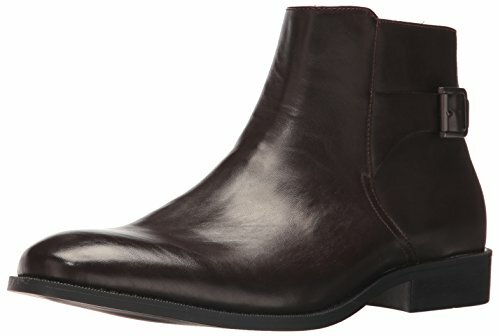 Pros: Decently priced boots for special occasions or elegant office wear. The monk straps give them a down-to-earth appeal that makes fancy dress a little less intimidating. These would complement slim jeans and a sports coat just as well as a linen suit. Cons: Not great for someone who doesn't have somewhat narrow feet. 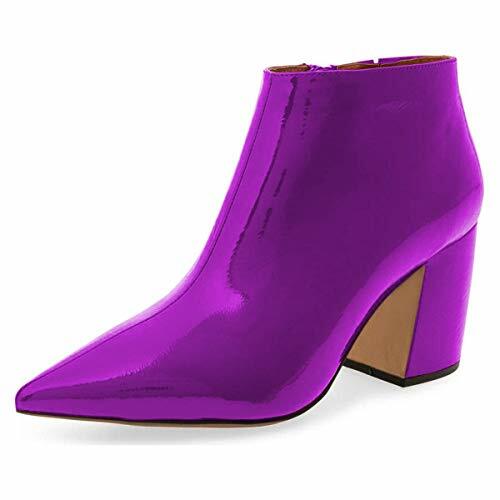 Sharp, short dress bootie for women in electric purple vegan leather. Has a pointed toe and a modern, slanted block heel. Chunky wrapped heel is just over 3". Inner side zipper offers easy in-and-out functionality. Rubber sole provides traction on slippery surfaces. Pros: Vibrant and fun yet simple and refined, these are the boots you can wear to weddings, dance parties or cafes after a stroll through the city. Pair with dresses, skirts, shorts, jeans — you can add these in anywhere your wardrobe needs a little excitement. The saturated purple color mixes well with floral patterns and bold jewelry. Cons: We're not sure if these boots have any inner padding. Men's black suede-like dressy chukka boot with lace-up fastening and faux leather detailing at the back of the ankle. Has an almond toe and subtle black stitching. Stacked heel has artistic brown and black layering. Lightly padded footbed ensures cushiony walking. Advertised as vegan: No, but these boots have man-made uppers and soles. Pros: Good everyday boots that can also make the cut for dressier occasions. That's the beauty of chukkas. If your fall look is a little too informal, try these on for size. Cons: Not necessarily adaptable to all types of formal events. These are more like dress-casual boots. 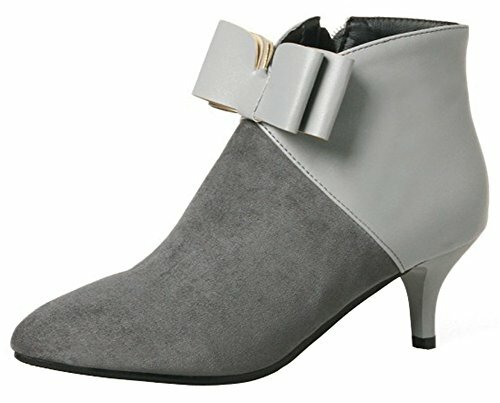 Adorable ladies' ankle bootie with a pointed toe and a chic gray bow. Upper foot is light gray vegan leather while the lower foot is a contrasting dark gray vegan microsuede. Short kitten heel is classic and comfortable. Slip-resistant outsole and padded footbed give you plenty of support. Pros: The best of the day and night worlds in one comfy little dress boot. Whether you're going to the art museum or cocktail hour at a swanky hotel, these are stunning shoes that won't kill your feet when you're standing or walking for long hours. Gorgeous, inexpensive and classy. Cons: None that we know of. Ultra slick men's black Chelsea boot with a pointed toe and black elastic side paneling. Boot rises just over the ankle. Wide fit allows for wiggle room so that the narrowing toe doesn't squeeze your foot. Pull tab aids the slip-on style. Advertised as vegan: No, but these are faux leather and textile boots. Pros: Great-looking boots with a cosmopolitan vibe if worn with nice slacks and a blazer and a rock star edge if worn with jeans. They're beautiful shoes for everyday or more formal attire. Cons: While these dress up well, they may not be ready for all formal events. It really depends on your style and the sort of function you're looking for.